There have been a lot of bad sermons in the world. Sermons about the Packers’ score, unicorns, global warming, lands of make-believe, funny stories that really aren’t funny at all, and a lot of other topics that leave parishioners willing Jesus to come back before the sermon is over just to make it stop. I’m not a pastor. I don’t know how hard it is to write ten minutes of theological genius each Sunday. I don’t know the sheep in the pew and what they need to hear. But here is what I do know: Pastors have, at best, one hour each week for church and ten minutes of that to pack all the Law and Gospel they can into a sermon. They have just ten short minutes to cut those of us listening down with Law, apply the sweet salve of the Gospel, and to give us Jesus . . . again and again and again. This fill-in-the-blank bit is the in thing. (1) It is too late. We all know about it already. (2) It is a Gospel substitute. (3) The world is perishing. So trust on this, pastors: If we want to watch know the score, we’ll check our phones. If we want to see unicorns, we’ll plunge ourselves into the Internet. If we want to hear tales of make-believe lands, we’ll lose ourselves in a good book. But if it’s Jesus we need (And it is! Because you, as pastors, have taught us that, and we thank you for it. ), we’ll go to church. And we’re counting on you to deliver the goods, the goods that the Internet, the theater, sports, and the world can’t. I’m not a pastor. I don’t know anything about sermons. But I am baptized, and I do know this: I just need Jesus: in the manger, flipping tables, outside Lazarus’s tomb, in the Jordan, on the cross, risen from the dead, on the altar, in the font, at the pulpit. Someone else can have the Packers’ scores, unicorns, global warming, lands of make-believe, and funny stories that really aren’t funny at all. Just give me the one thing needful. Just give me–give all of us–Jesus. 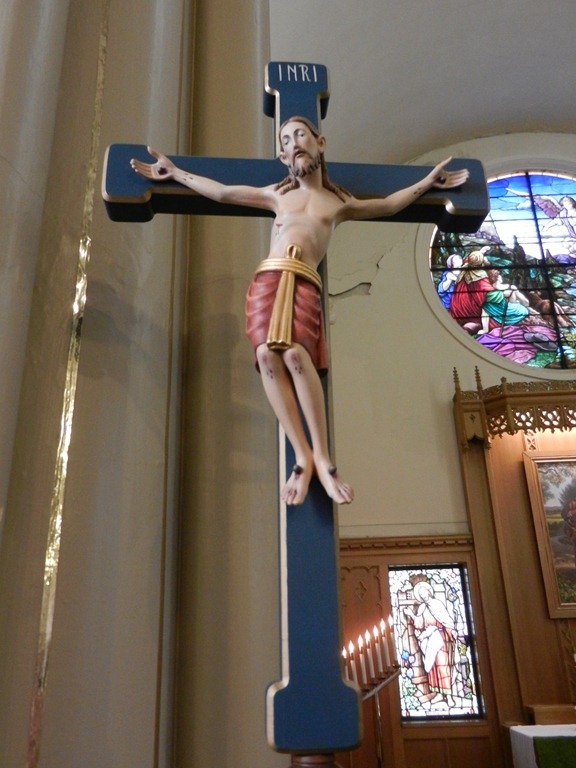 *Photos of Emmaus Lutheran Church, St. Louis, Mo. I find it almost unbelievable that pastors who rush through communion will at the same time spend half their sermon on analogy that amuses more than helps. You said everything thing I’ve ever wanted to say about tedious, uninformative sermons that don’t help people see Jesus. My family still laughs hysterically when we remember a particularly moving Christmas sermon about a groundhog. How do you mess up the story of Christmas? That should be the slam-dunk sermon for Pastors everywhere. A groundhog has no place in my Christmas sermon, thank you. Your pastor’s sermons are only ten minutes? Ours are at least twenty. Should be the prayer of every pastor as they begin the prep for their sermon, as they study and write, and as they preach it. Whatever it takes, as the Spirit moves, for that Word to be taught and preached in all its fullness, goodness, and sweetness… let us not be a hindrance. Yes, you have hit upons something here, first the correct. No one cares about the pastor or what he things, or what happened to his family on his last vacation, or about an experience he had in 10th grade. Pastor, shut up. If you are not going to speak 10 minutes of theology, don’t speak at all. Personally, I make it an iron-clad rule never to use the words: I, me, my, mine in a sermon. I make no personal references to me, my family, or any other person, only God in Christ and those persons who are part of the text. On the other hand even if the pastor messes up and says and does things that are off subject, he doesn’t just have 10 minutes. The entire liturgy is a type of sermon: the versicles, response, prayers, creeds, readings, sacraments, hymns, etc. Please tell all pastors: no one cares what you think, know, do or experience. The sermon is NOT about you even in the least. It is about Christ. Thank you for listening to my rant. I don’t agree. Didn’t Jesus use parables? Didn’t He use those stories and the images they evoked to convey important messages? Within the Bible itself can you not find stories and even poetry? If Jesus spread His message by using people, moments and images from the everyday life of those he was speaking with, why would it be wrong for pastors to do so today? By putting an important message into an understandable context you are not always ‘trying to be loved or to be seen as the listener’s buddy’. Maybe you are breaking down a barrier that allows someone greater understanding of the gospels. Over one third of the gospels of Matthew, Mark and Luke are parables used by Jesus to reach the hearts of those listening, to make timeless realities understandable to everyday listeners. So give me Packer’s scores, unicorns, soccer, global warming, your children and any other ideas that come to you to help me see my relationship with Jesus through fresh eyes. Speak to me as Jesus did to those who were privillaged enough to hear God’s amazing word straight from His own mouth. Speak in terms I understand, use stories I am familiar with, use people, ideas and cultural inferences of the present. NONE of that detracts from His message if used for His purposes. Kind of like Paul’s references to him boxing or wrestling..
It’s not always easy, but it’s what we do. We can. We must. Pastors that add the junk of which you speak are searching for “acceptance” by the listener. They want to be loved and the listener’s buddy. That’s not what they have been called to do. “Sir, I want to see Jesus.” So give them Jesus. You can do it in 10 minutes. You can do it in more, even less. Just do it. Just curious how recent you have to look to find a 10 minute Lutheran sermon. Pretty sure the good Doctor Luther, and Walther had full liturgies, but 10 minute sermons? Surely 20 more wee minutes of the preached Word wouldn’t hurt anyone, would it?